Our Bag2School fundraising initiative has helped raise a lot of money for Friends of WBS in previous years, and staff, students and parents have been very forthcoming in donating clothes and other items. We're kicking off 2017 with a collection on Friday, Feb 3 and we'll be making the bags available early in January, so don't be tempted to throw away that Christmas jumper on Boxing Day; hang on a little while and put it to good use. Remember - you can always use a bin liner or other carrier bag if you'd rather, as long as you can get it here for collection by February 3. 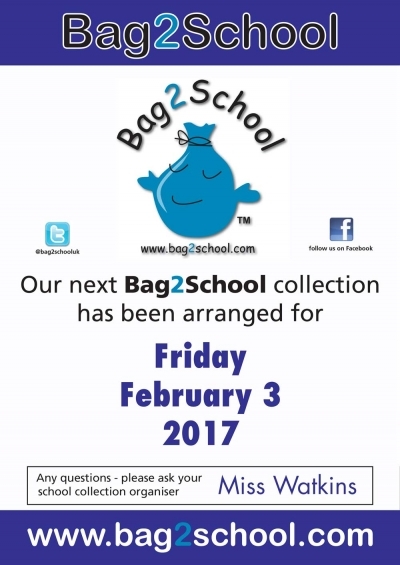 Anyone with any questions about Bag2School should seek out Miss Watkins, who can advise on what items are allowed etc. Many thanks for your support in our previous fundraisers and we hope you'll be able to rise to the challenge of making this our biggest Bag2School collection ever!